CLEARCOAT 66 is a clear single component, moisture cure, aliphatic urethane coating. It produces a tough, glossy, hard wearing and chemically resistant surface. CLEARCOAT 66 may be used alone as a tough gloss coat over concrete, wood, fiberglass composite, or other approved substrates. 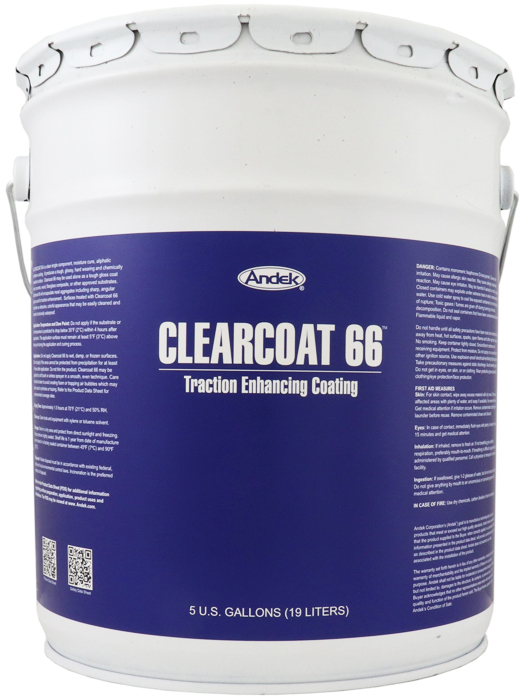 CLEARCOAT 66 will encapsulate most aggregates including sharp, angular types used for traction enhancement. Surfaces treated with CLEARCOAT 66 maintain an attractive, colorful appearance that may be easily cleaned and remain functionally waterproof. Encapsulates rough, angular aggregrates to form highly traction enhanced surfaces on floors in constantly wet processing areas such as breweries, car washes, etc. Produces a waterproof, high-grip finish when combined with vulcanized rubber granules around swimming pools. Seals mineral composites in zoological diaramas for marine reptiles and mammals. Will seal non-potable cisterns and impluviums without leaching anything anything obnoxoius into the water. Can be used over concrete, fiberglass composite, insulation, most metals, mineral composites, wood, wood composites, rubber, plastic composites, slate, tile and other surfaces. Do not apply Clearcoat 66 to wet, damp, or frozen surfaces. Do not apply if the area cannot be protected from precipitation for at least 4 hours after application. CLEARCOAT 66 may be applied by brush or roller, in a thin, even coat. Care should be taken to avoid creating foam or trapping air bubbles which may later result in pinholes or hazing. Do not thin the product. If traction enhancement is required, the use of synthetic resin aggregate is recommended. Aspergrit from SoftPoint Industries is available in one-pint containers from Andek Corporation. This transparent grit aggregate remains close to the surface to create maximum effective traction and is completely transparent. It is applied at a rate of up to 1 pint per 100 square feet using broadcast technique. Approximately 24 hours at 70°F (21°C) and 50% RH.